It is time to get out and win that unspoken competition you have going with your neighbors over who has the best Christmas Light Display. Fortunately for you, I made this video to show you how to put up Christmas lights without going all “Clark Griswald” up in your crib. The posts and video all work together and should clear up any questions, however, I would be glad to answer any you have: just leave them in the comments below. Posted by Allyn on November 27th, 2008. 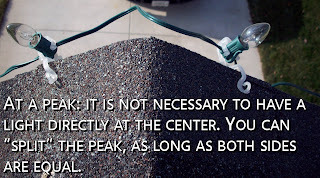 It’s time to put our lights in the yard and on the roof! Isn’t this exciting? In part 1, we went over the philosophy behind clean, neat and classy Christmas decorations, as well as decided on materials and organization. Now get up on the roof! 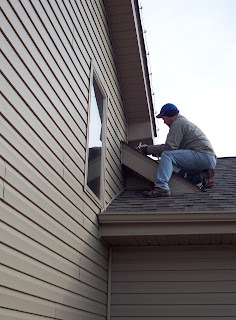 You will find that even with the best of plans, you will inevitably end up having to move some clips around between transitions of peaks and gutters…be patient and think safety! 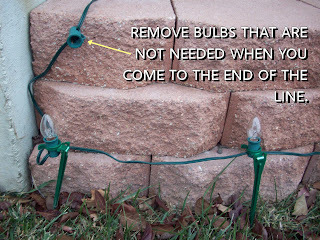 Be sure to stretch the cords completely between lights. They are manufactured exactly 6″ apart, so there is no need to measure the distance from clip to clip. They will automatically be perfect! Simple right? 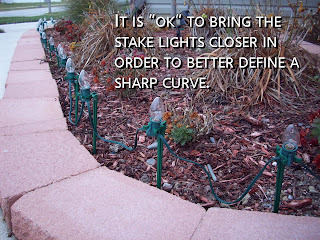 Place the light stakes around the natural curves of your landscape beds.If you happen to hit a dead spot, (a place where there is nowhere to hook the light or where one is not needed) you can just remove the bulb from that socket. Modern lights will operate with missing bulbs. (see picture). Finally, using your extension cords, plug everything into your power supplies and set your timers. This is also a good time to make sure all the lights are working. Sometimes they come loose while you are clipping them. As a reminder, be sure you are not putting too many strings in a line or you will blow fuses in the lights, causing a major headache. Follow the guidelines on the lighting package. Here’s one last tip that will save you some headaches next year! (never too early to plan ahead.) 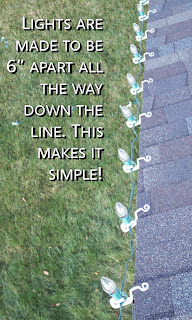 Since all of your roof line clips are correct now, you should mark the strands of lights end-to-end with some varied color paint. This way, next year, you match up the paint from male-to-female ends and everything should line back up perfectly on the roof. You just need to make a note of the color order and where to start. I am so excited to show you the finished product in Part 3. This post is #2 in a 3-part series. 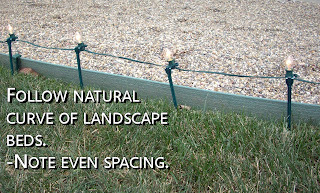 See below under “You might also like” for the other posts about Christmas Lights. You can buy Christmas Lights Online Here. Posted by Allyn on November 13th, 2008.